Native to Iraqi marshes. 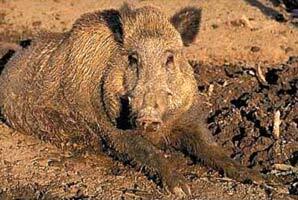 The wild boar is a challenge to hunt. Though they are poor eye sighted, they possess sharp smelling and hearing senses.The wild boar’s sharp tusks are lethal weapons. They, sometimes reach over 15 centimeters in length. They are used to dig the ground searching for food.Some native Christians and foreigners hunt boars in the southern marshes of Iraq for food. Moslems, however hunt them to feed their dogs and to save their orchards.